The NASA - Voyager 1 Spacecraft took this Narrow-Angle Camera image on March, 5, 1979 from a distance of about 69.000 Km (such as approx. 42.849 miles) from the Jovian, Volcanic moon Io. 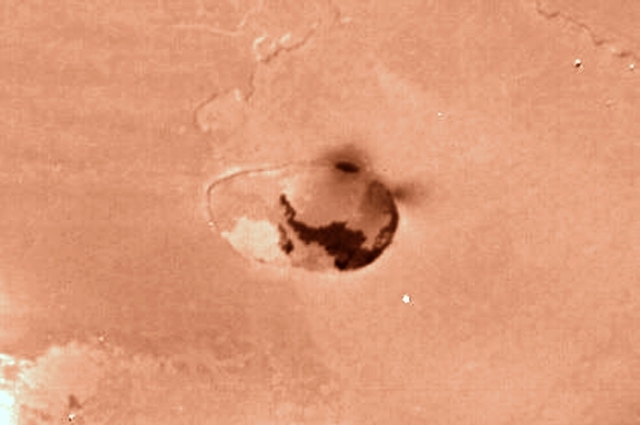 The Surface Feature shown here is an Unnamed Volcanic Caldera which may be actively spewing (--- ejecting at a very high velocity) Material into the Space around Io (look at the very dark brown-reddish "fuzz" located near the upper-right (Dx) side of the Caldera Rim). In addition, a large amount of very dark Lava has flowed out of the Fissure (as a matter of fact, we, as IPF, believe that there are at least three Active Fissures located near the Edge of the Caldera) and spread on (---> covered part of) the Floor of the Caldera. The pinkish color of the Surface surrounding the Caldera is, most likely, due to the presence of extremely large quantities of Sulphur-based Particles which, being too light and slow, did not escape from the Gravity Field of Io and, some time after they were expelled from the Caldera (or - maybe - from other active Volcanoes located nearby), fell back down on the moon, like a "dusty rain". This image (which is an Original Mars Odyssey Orbiter b/w and NON Map-Projected frame published on the NASA - Planetary Photojournal with the ID n. PIA 02288) has been additionally processed, extra-magnified to aid the visibility of the details, contrast enhanced and sharpened, Gamma corrected and then colorized (according to an educated guess - or, if you prefer, an informed speculation - carried out by Dr Paolo C. Fienga/LXTT/IPF) in Absolute Natural Colors (such as the colors that a normal human eye would actually perceive if someone were onboard the NASA - Voyager 1 Spacecraft and then looked ahead, towards the Jovian Volcanic moon Io), by using an original technique created - and, in time, dramatically improved - by the Lunar Explorer Italia Team.